HOW MANY GLUTEN PROTEINS CONTAIN CD-TOXIC SEQUENCES? ARE SOME PROTEINS MORE TOXIC THAN OTHERS? Chapter 13: MALTING OF SORGHUM AND BUCKWHEAT FOR BREWING PURPOSES—A GLUTEN-FREE ALTERNATIVE TO BARLEY? In genetically susceptible individuals, the ingestion of gluten and related proteins triggers an immune-mediated enteropathy known as celiac disease (CD). Recent epidemiological studies have shown that 1 in 100 people worldwide suffers from CD—a rate that establishes CD as one of the most common food intolerances. CD patients that eat wheat or related proteins, such as hordeins (barley) and secalins (rye), undergo an immunological response, localized in the small intestine, that destroys mature absorptive epithelial cells on the surface of the small intestine. Currently, the only way to treat CD is the total life-long avoidance of gluten ingestion. Therefore, people that have CD must follow a very strict diet and avoid products that contain wheat, rye, and barley. Avoiding cereals leads to a recovery from the disease and significant improvement of the intestinal mucosa and its absorptive functions. Celiac patients are not in the position to eat some of the most common foods, such as breads, pizzas, and biscuits, or to drink beer and whiskey. Because of the unique properties of gluten, producing good-quality gluten-free products is a big challenge for scientists. 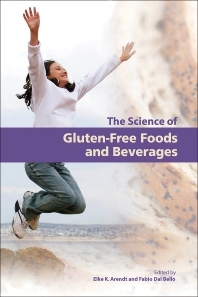 Science of Gluten-Free Foods and Beverages covers the work presented at the First International Conference on Gluten-Free Cereal Products and Beverages. The area of gluten-free foods and beverages is becoming more and more important, since the number of people with CD and gluten allergies is rising. In the United Kingdom, 10% of the population claims to have food allergies. This book will be extensively referenced. It is meant to give an overview of the work being carried out in the area of gluten-free science.